I'm so tired of seeing these horrible fad diets come and go--junk science, I say! This book is full of sound nutritional advice based on the most recent studies (there are more than 150 pages of footnotes that refer to the studies). Find out exactly how your food affects you! You'll be glad you did. "The primary determinant of our health and well-beingis what we eat and how we live. In this extraordinary and empowering book, Dr.Michael Greger explains why. Highly recommended." "Stop whatever you're doing and buy this book. Not onlydoes Dr. Michael Greger drop a metric f*ckton of evidence that a plant-baseddiet will save your damn life, he lays out the blueprint to make it happen. Dr.Greger shows us how regular folks can eat well and not get taken down by sometotally preventable bullsh*t."
"A new way of looking at nutrition and health. Michael Greger shows peoplehow to save their own lives." "Finally a physician has pulled together the latest scientific studies onhow to fight disease and prolong life. How Not to Die shows how theright nutrition prevents disease and transforms our genes so we can livehealthier, longer. Empowering, groundbreaking, transformative work." "Michael Greger, M.D. scours the world's scholarly literature on nutritionfor the most interesting, groundbreaking and practical new research. 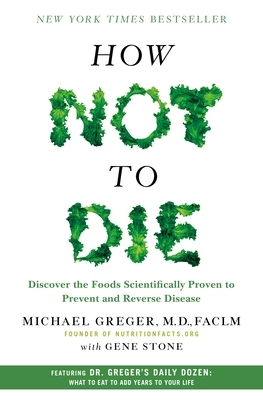 His workat NutritionFacts.org and in HOW NOT TO DIE features the latest science onnutrition and health to show how to treat and prevent disease." "An absolute rhapsody of informational wisdom on how toachieve a life of health and longevity without disease." "How Not To Die is one of the mostimportant books on health ever written. Dr. Greger shows us how to prevent andsometimes reverse all the major diseases that are killing us. We have thegenetic potential to live disease free lives full of health and vitality untilwe are past 100. This book is the scientific road map we need to do exactlythat." "Absolutely the best book I've read on nutrition anddiet." "Meticulously well-documented, Greger's guidebookprovides evidence on everything from the pesticide-Parkinson's connection tothe role of antioxidants in breast cancer prevention. Gerger also offers upfriendly tips, like his favorite smoothie recipe and a turmeric tutorial.Follow his advice and you may not live forever, but you'll almost certainlylive a healthier life." "This book brims with valuable insights. Dr Gregertends to rely on the gold standard of medical research randomised controlledtrials rather than the latest fads. Vegetarian or not, this book is a great wayto improve your diet."